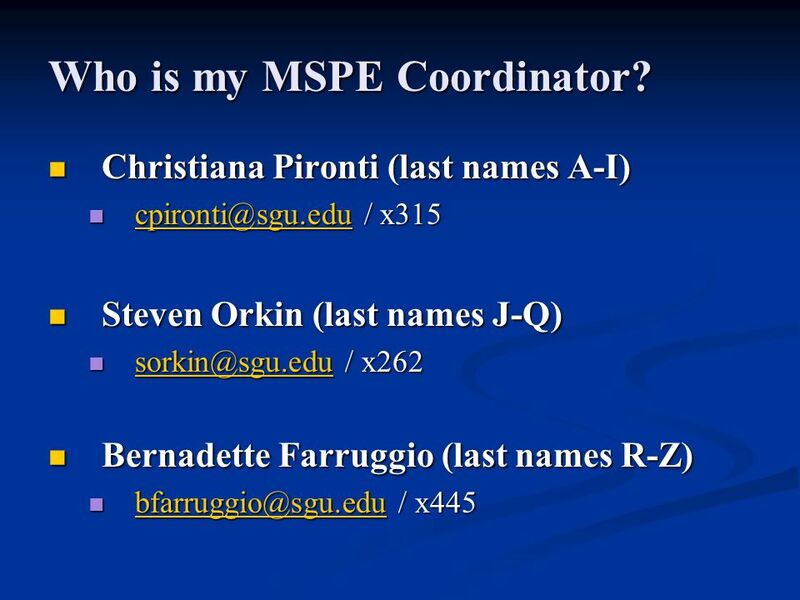 2 Who is my MSPE Coordinator? 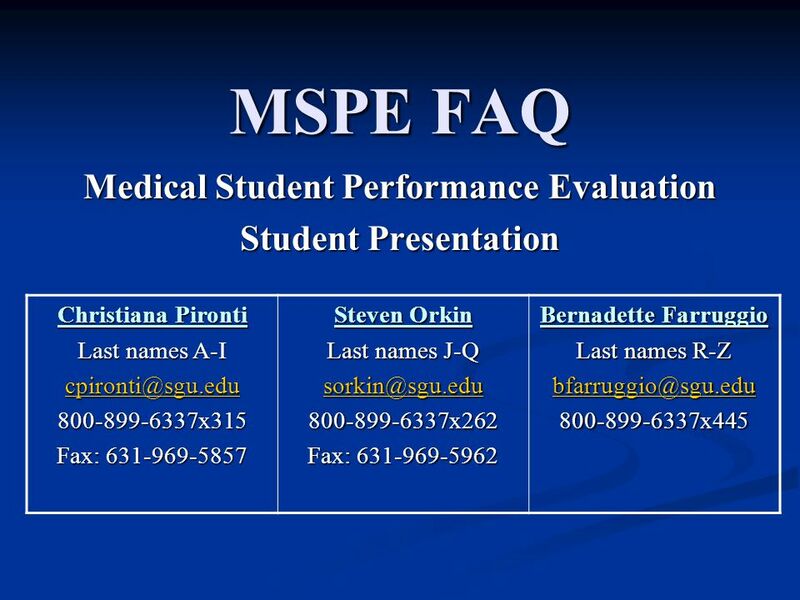 5 How important is the MSPE? 7 When do I send my documents? 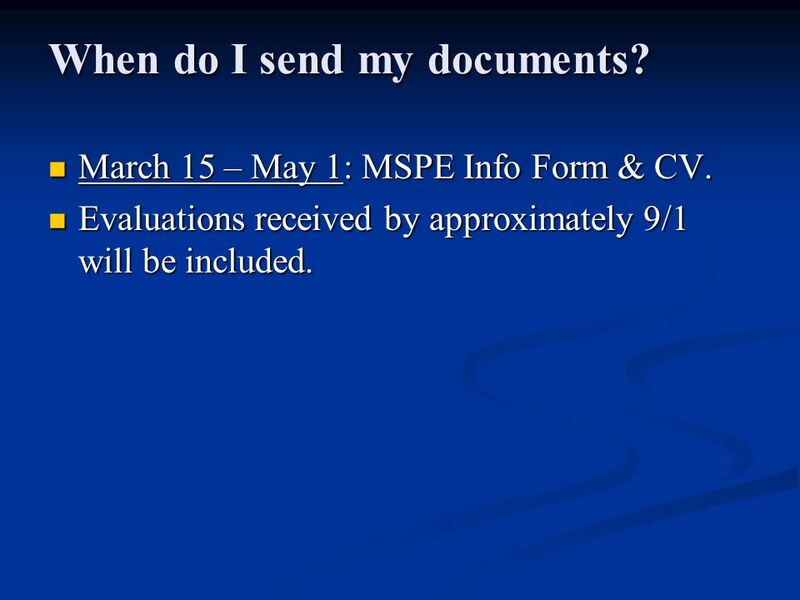 March 15 – May 1: MSPE Info Form & CV. Evaluations received by approximately 9/1 will be included. 8 Provides time for you to review it and make any changes. Why can’t you add materials received after 5/1 if the MSPE’s can’t be read until 11/1? Provides time for you to review it and make any changes. Approximately 800 MSPE’s will be written for the 2011 Match. 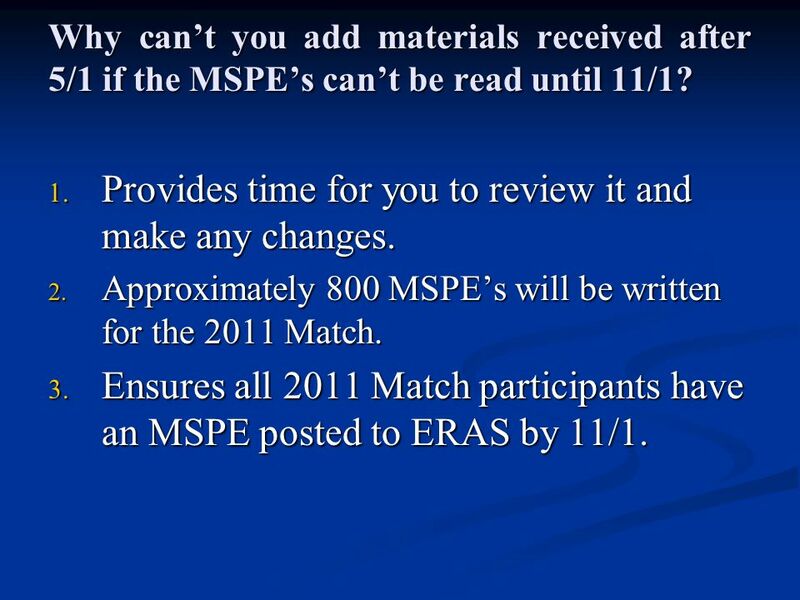 Ensures all 2011 Match participants have an MSPE posted to ERAS by 11/1. 9 How do I send my documents? 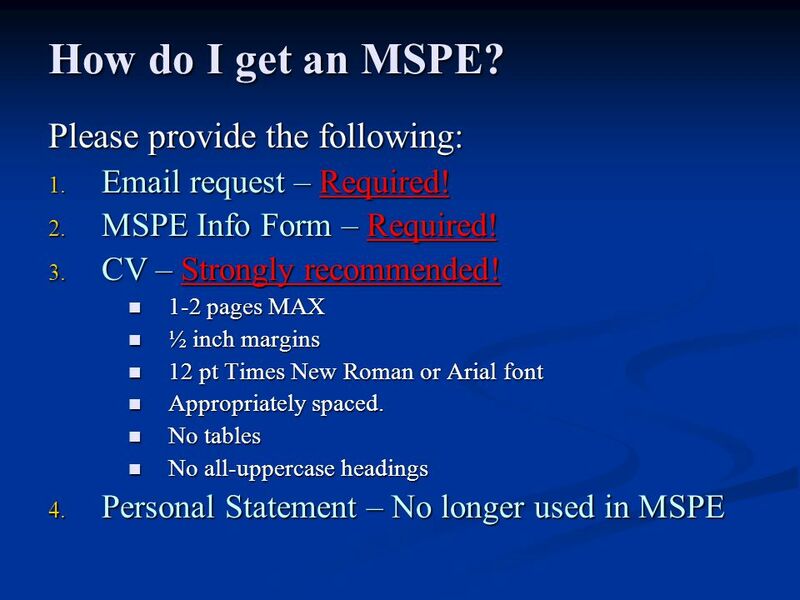 MSPE form & CV Must be ed as Microsoft Word attachments. No PDF’s! 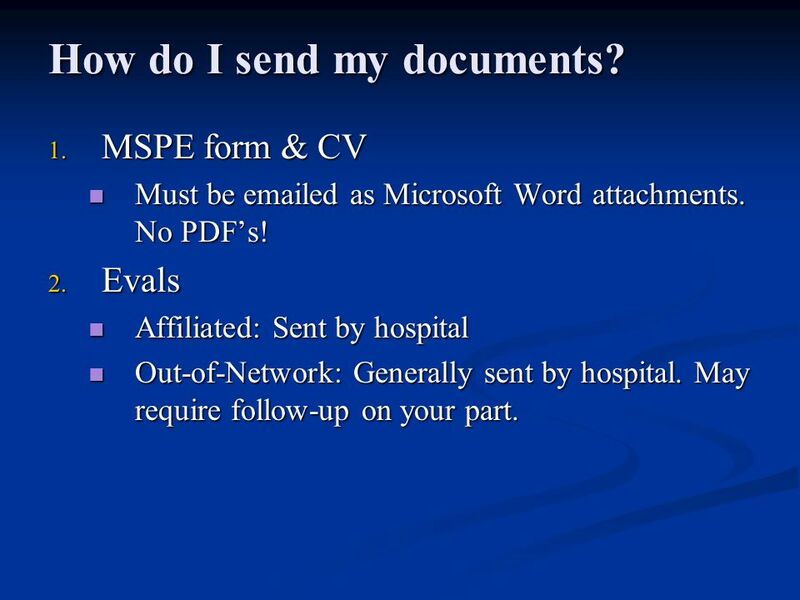 Evals Affiliated: Sent by hospital Out-of-Network: Generally sent by hospital. May require follow-up on your part. I graduate in 11, but will not be in the 11 Match. Does the timetable apply to me? Sort of. 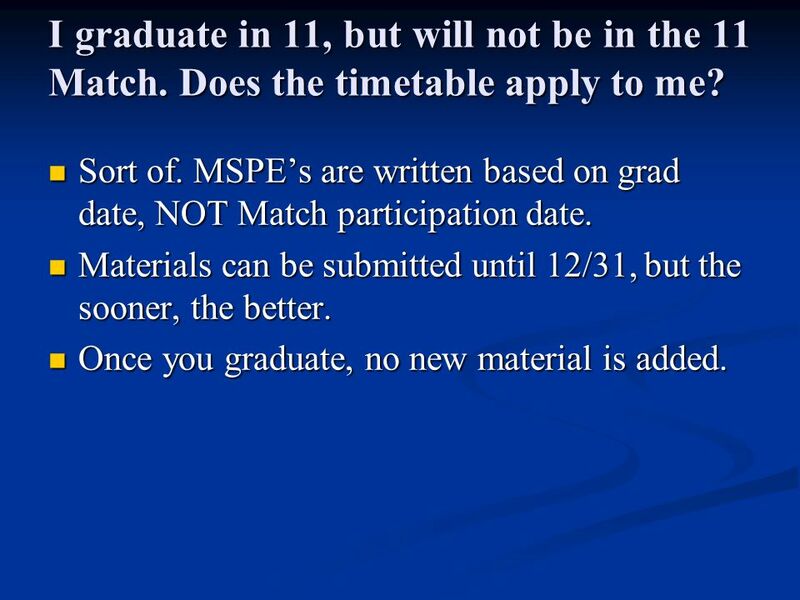 MSPE’s are written based on grad date, NOT Match participation date. Materials can be submitted until 12/31, but the sooner, the better. Once you graduate, no new material is added. I’m applying to more than one specialty. Can I have more than one MSPE written? No. 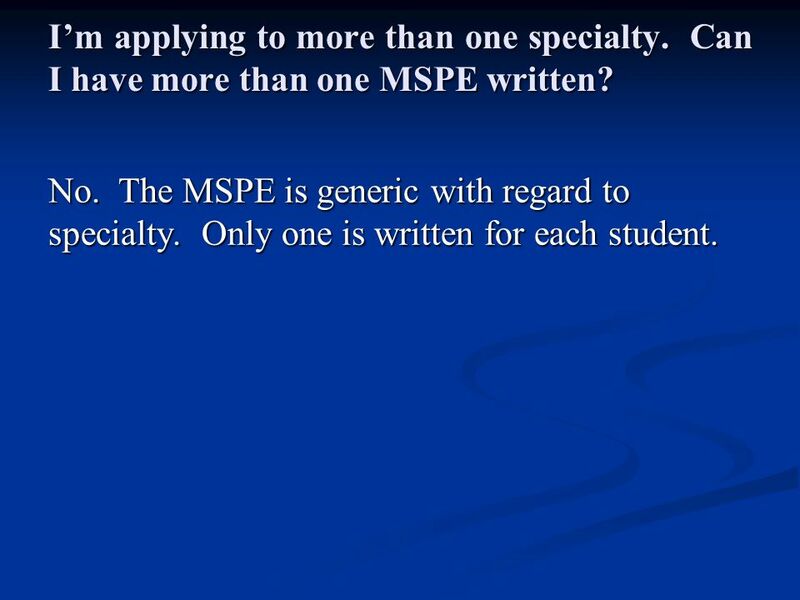 The MSPE is generic with regard to specialty. Only one is written for each student. 12 When will my MSPE be completed? 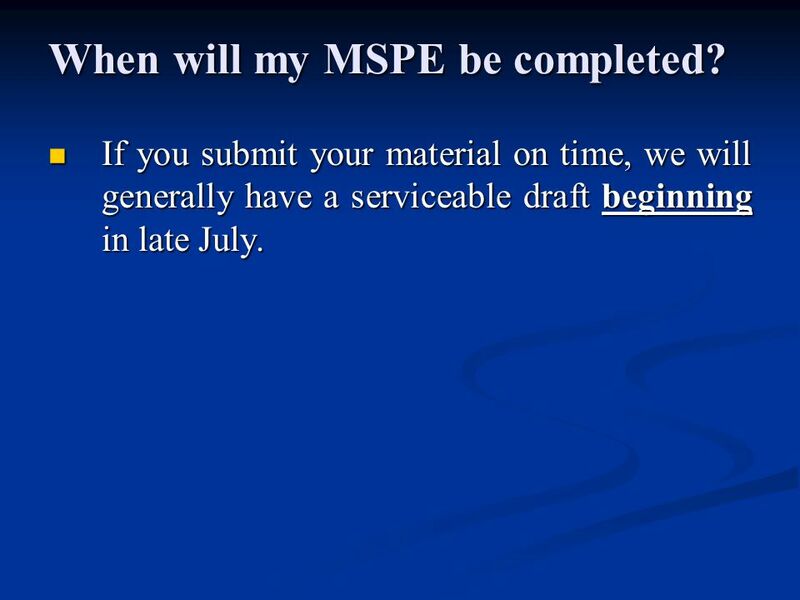 If you submit your material on time, we will generally have a serviceable draft beginning in late July. 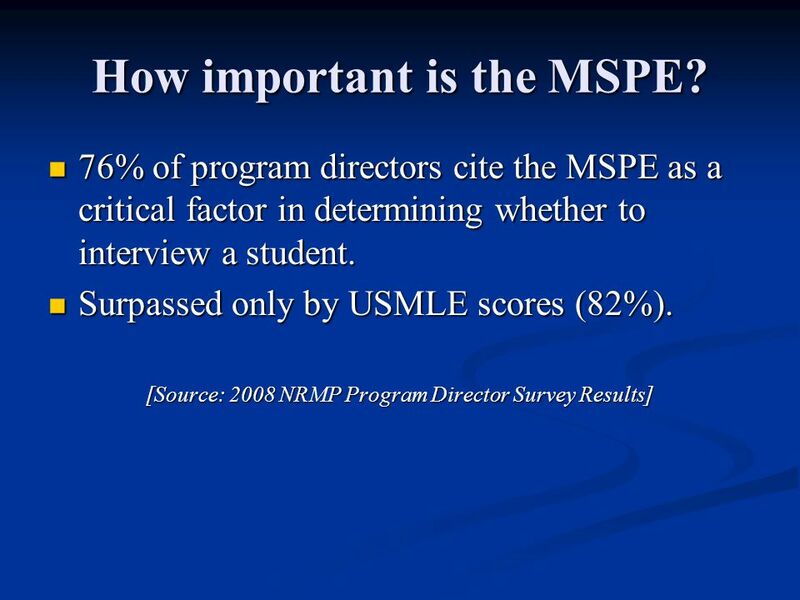 13 When will my MSPE be sent to ERAS? 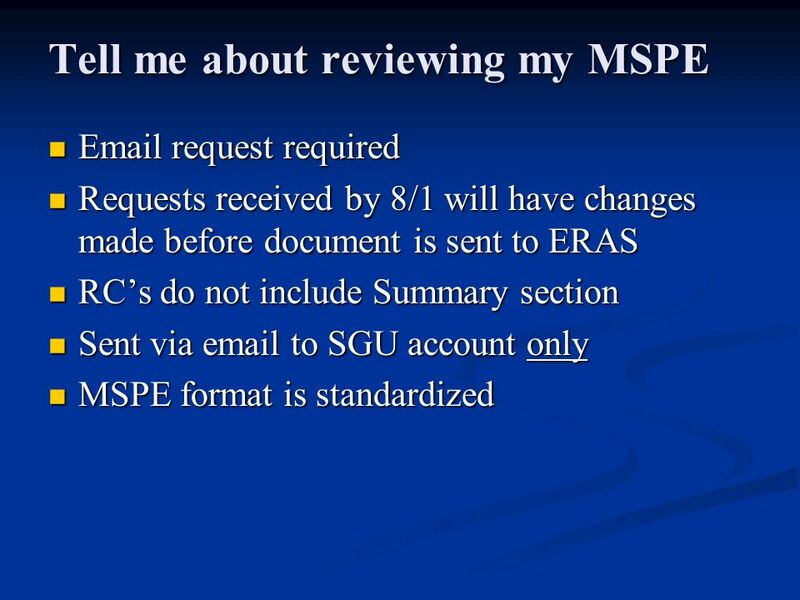 MSPE’s will be sent to ERAS throughout October, not on November 1. 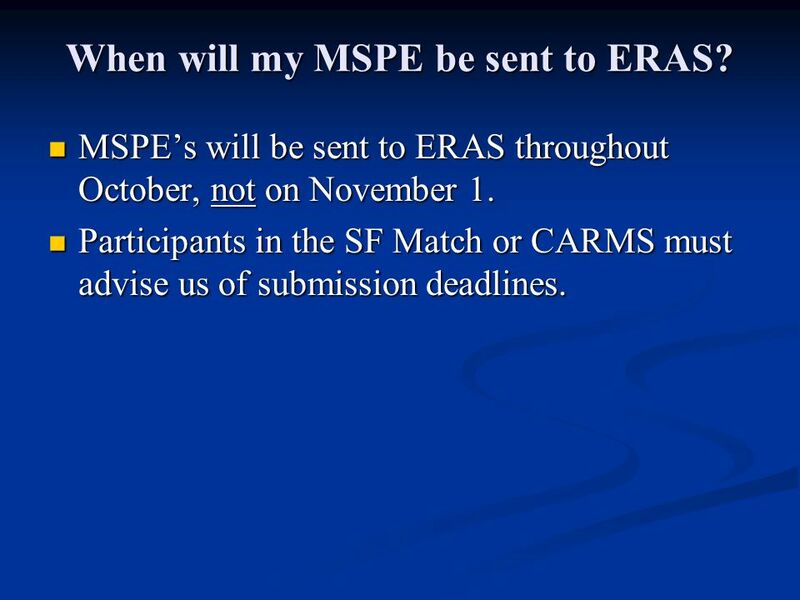 Participants in the SF Match or CARMS must advise us of submission deadlines. 16 Not that I’ll have any, but tell me about negative comments on my evals. 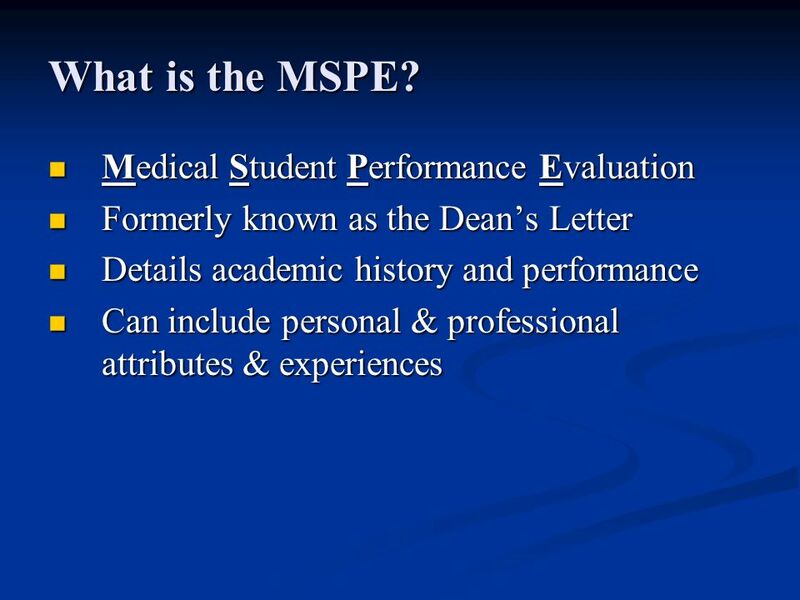 The MSPE is intended to be an objective evaluation summarizing all aspects of your medical school experience. 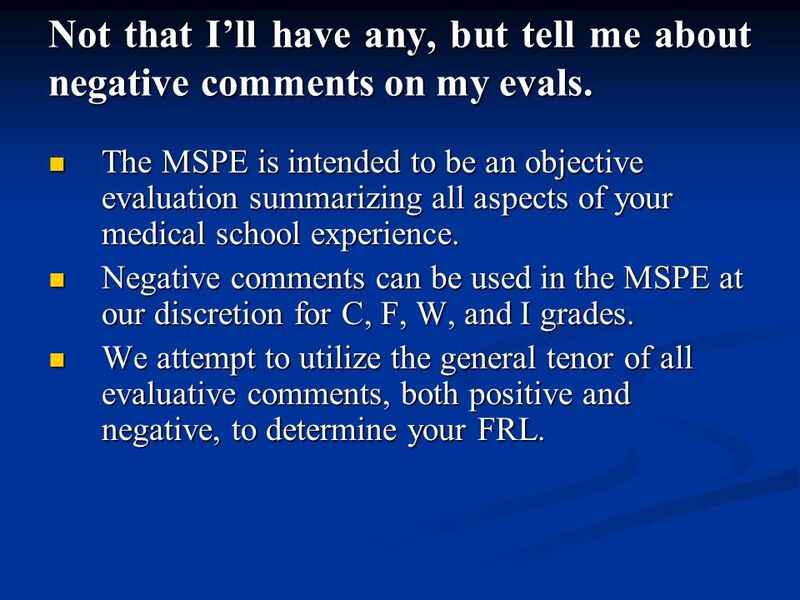 Negative comments can be used in the MSPE at our discretion for C, F, W, and I grades. 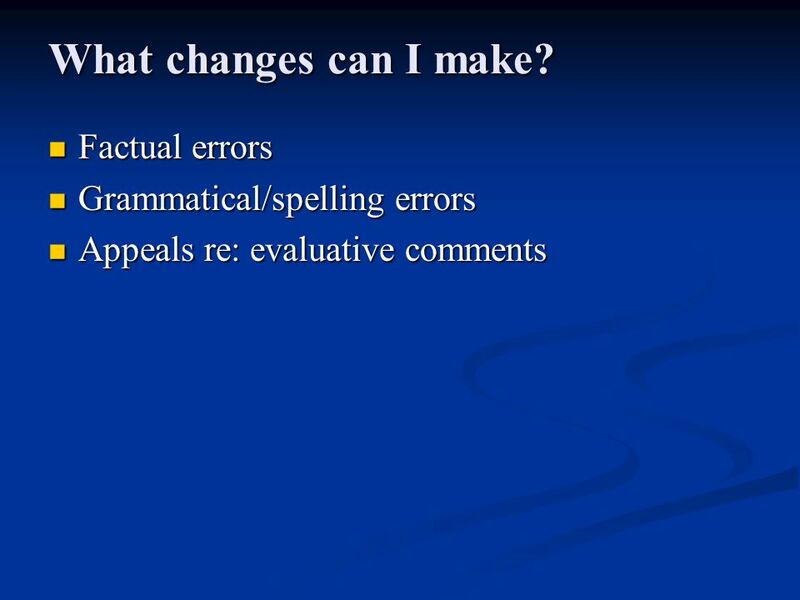 We attempt to utilize the general tenor of all evaluative comments, both positive and negative, to determine your FRL. 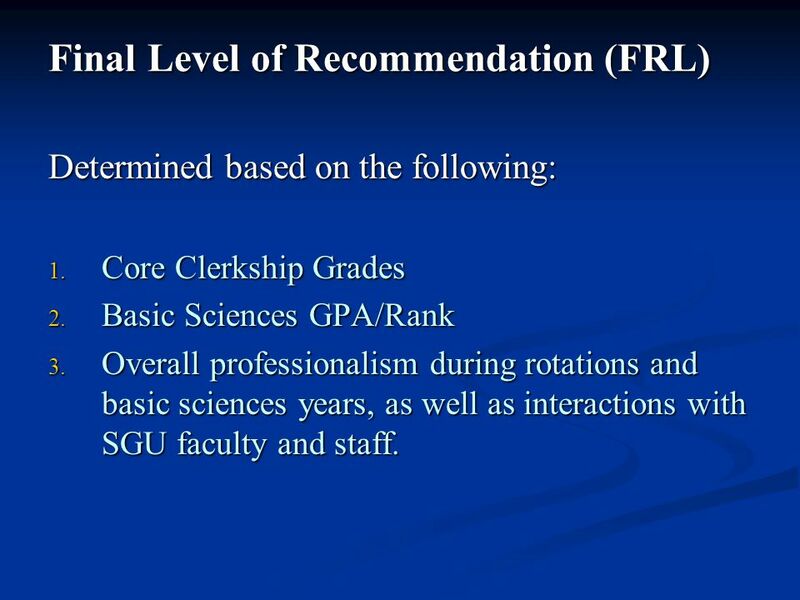 Determined based on the following: Core Clerkship Grades Basic Sciences GPA/Rank Overall professionalism during rotations and basic sciences years, as well as interactions with SGU faculty and staff. 18 Will you send my transcript to ERAS? Yes, but you must send the following: Transcript Check! 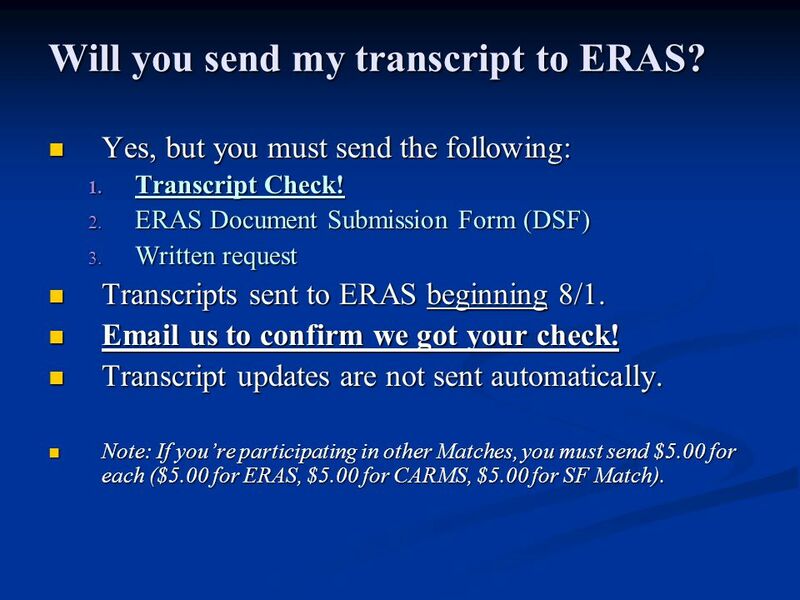 ERAS Document Submission Form (DSF) Written request Transcripts sent to ERAS beginning 8/1. us to confirm we got your check! Transcript updates are not sent automatically. Note: If you’re participating in other Matches, you must send $5.00 for each ($5.00 for ERAS, $5.00 for CARMS, $5.00 for SF Match). 19 Where can I get more information? 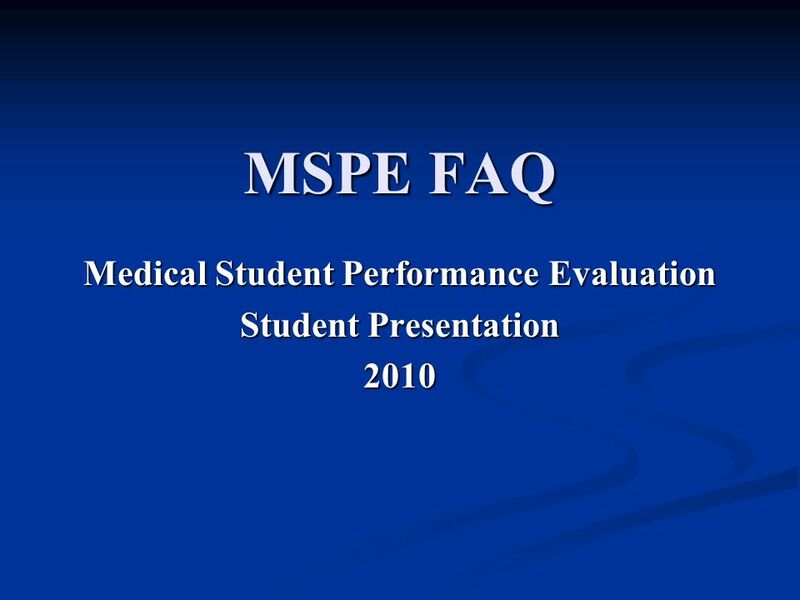 Download ppt "Medical Student Performance Evaluation Student Presentation 2010"
Guidance on CVs, covering letters & application forms in Placement Booklet and on S4S Bb site follow guidelines closely Remember the aim of a CV. 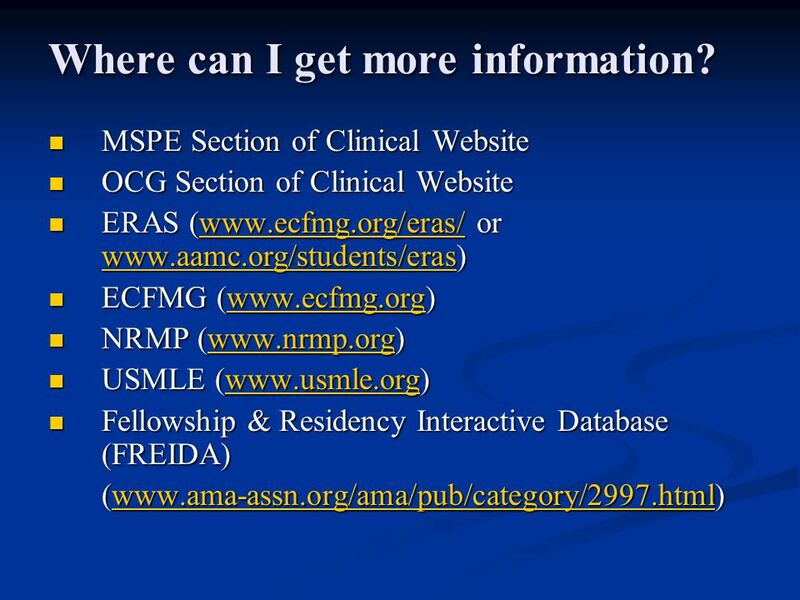 ERAS Electronic Residency Application Service Scott Davenport March 29, 2013. Jessica Wilcome Program Coordinator Grand Rapids Medical Education Partners Michigan State University. FELLOWSHIP Information Chief Resident: Michael Kim, M.D. Fellowship Cycle 2012. Medical Residency Application: The Personal Statement Writing Well to Sell Yourself Elizabeth Lefebvre, McGill University UGME Career Planning Office May. Fall Funding is an important part of academic career Developing funding application skills early on will lead to academic success Funding proposals. 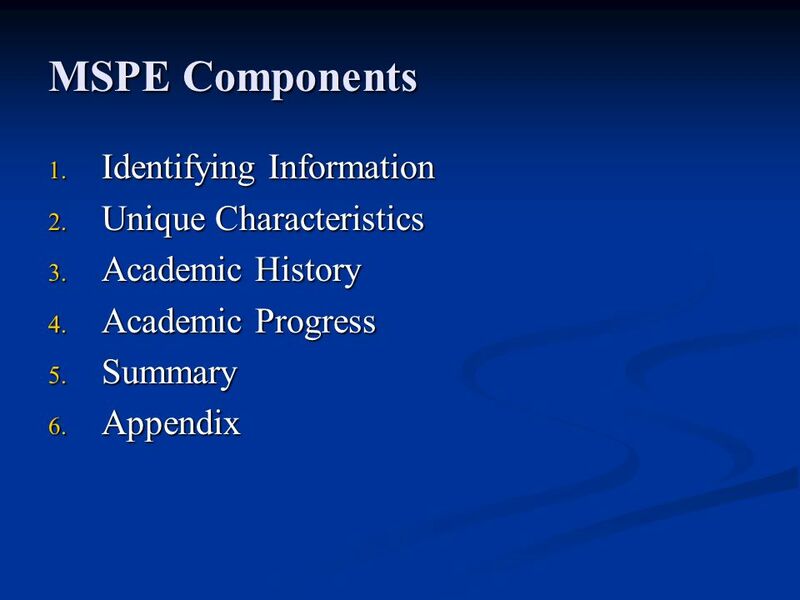 Presenting Yourself on the UC Application & Personal Statement Freshman Applicants Fall 2012. College Application Process Upper Dublin High School Guidance Department. Michael Ott MD, M.Sc. Schulich School of Medicine University of Western Ontario London Health Sciences Centre. UCAS Apply What is it? UCAS Apply is a web-based system for students to apply to university. All students are given login details and they fill. Observer Schedules Pre-Observation Conference To schedule a pre-observation conference, select Schedule. Wayne State University School of Medicine Department of Internal Medicine Advice for Year IV. BHHS Class of Naviance 2. Common Application 3. Non-Common App Schools 4. Parchment: Ordering Transcripts. Welcome to Student Teaching Are you eligible to student teach? Completed all MAJOR and COGNATE area courses ◦ Check with Advising if you have. The Match Process Getting Into a Residency Program.